Why should wait for long time to e-File.The ultra fast eFiling makes your tax filing an experience, with high security standards (256 - bit encryption ). The process will be completed within 2 minutes for most. 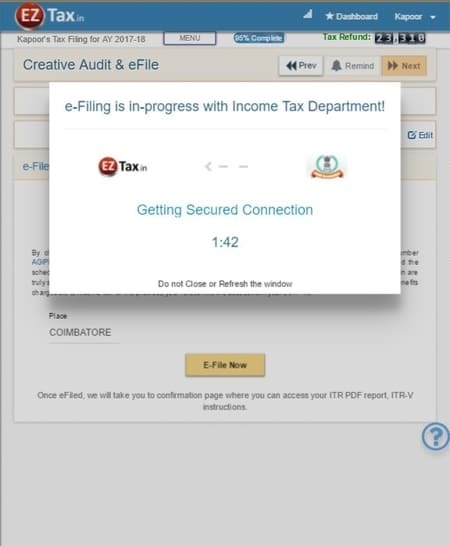 Once filed , you can download your customized ITR report in PDF format, along with e-mail communication with reminders. EZTax.in will be glad to help you via chat and phone call also. Now you can file for 2017-18 and 2018-19 assessment year questionnaires are available to use! EZTax relieves you from boredom in e-filing !